latest interview: Interview: Rex Orange County on 'Apricot Princess' and life lessons learnt from love. Music Hippo Campus cover Rex Orange County's 'Loving Is Easy'. Music Rex Orange County announces Laneway sideshows. Music Watch: Rex Orange County covers Justin Bieber's 'Love Yourself'. Music Interview: Introducing Thea and her new single 'So Simple'. Music Watch: Rex Orange County x KCRW. Music Shop: Rex Orange County’s 'Apricot Princess' on vinyl! Music Rex Orange County unveils new Apricot-print merch. Music Listen: Peter CottonTale's new song 'Forever Always' feat. Rex Orange County, Chance The Rapper, Daniel Caesar + more! 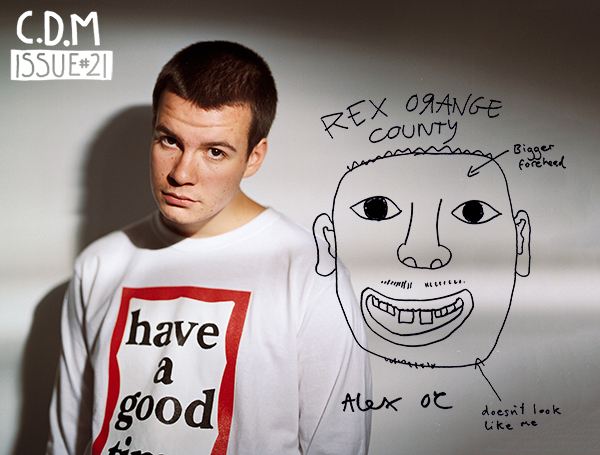 Music Listen: Rex Orange County covers 'You've Got A Friend In Me' with Randy Newman. Favourites Rex Orange County announces 'Apricot Princess' vinyl pre-order. Music Must-watch: Rex Orange County performs 'Loving Is Easy' live on The Tonight Show. Music Watch: Tove Styrke covers Rex Orange County's 'Loving Is Easy'. Music Watch: Rex Orange County + Tyler, The Creator perform 'Boredom' together live. Music Watch: Rex Orange County's 'Rex In New York' documentary. Music Review: Rex Orange County - KOKO, London, February 2018. Music The Best Albums Of 2017. Music Rex Orange County - 'Loving Is Easy' music video. Music Rex Orange County - 'Sunflower' music video. Music Watch: Rex Orange County + Skepta perform 'Man'. Music Listen: Rex Orange County’s new song 'Edition'. Music Interview: Rex Orange County on 'Apricot Princess' and life lessons learnt from love. Music Rex Orange County, Lana Del Rey + more announced for Tyler The Creator’s 2018 Camp Flog Gnaw.